In 1982, we helped pioneer the craft of refacing cabinets, giving homeowners a cost effective way to reuse existing cabinets by replacing the trim, doors and drawer fronts. Today, Kitchen Solvers is a complete kitchen remodeling system offering cabinet refacing, new custom cabinets, countertops and more. After remodeling more than 40,000 kitchens, we've developed incredible kitchen design expertise, terrific relationships with our vendor partners, unmatched buying power and an industry-leading franchise system. 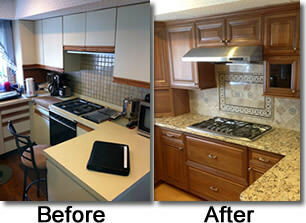 Kitchen Solvers has helped more than 45,000 people nationwide remodel their kitchens. Kitchen Solvers offers a full range of options to help give customers their dream kitchens. We are truly a "best solutions" service provider for kitchen remodeling that few competitors can match. Once you decide we are the right partner and you become a Kitchen Solvers franchise, we become a perfect fit for you by creating a training program with follow up coaching that best meets your unique needs and leverages your strengths. At Kitchen Solvers we are firm believers that learning sound business principals is fundamental to operating a franchise efficiently and profitably. Franchise owners do not need experience on carpentry or remodeling to be successful. But what they do need is a passion for owning a business and providing customers with exceptional, highly personalized service. We are looking for people who are self-motivated and want to build a successful, growing business. Kitchen Solvers Kitchen Remodeling is currently accepting inquiries from the following states: Wyoming, West Virginia, Wisconsin, Washington, Vermont, Virginia, Utah, Texas, Tennessee, South Dakota, South Carolina, Rhode Island, Pennsylvania, Oregon, Oklahoma, Ohio, New York, Nevada, New Mexico, New Jersey, New Hampshire, Nebraska, North Dakota, North Carolina, Montana, Mississippi, Missouri, Minnesota, Michigan, Maine, Maryland, Massachusetts, Louisiana, Kentucky, Kansas, Indiana, Illinois, Idaho, Iowa, Hawaii, Georgia, Florida, Delaware, Washington, D.C., Connecticut, Colorado, California, Arizona, Arkansas, Alabama, Alaska.